What would you do without your sleep? Unfortunately, too many hard working Americans know what it feels like to do without sleep. With an rising rate of sleep apnea and back pains from unnatural long hours of sitting, grabbing a good night’s sleep is not always easy. But you spend ⅓ of your life in bed. A quality night’s sleep is essential, and thankfully we have the technology to help us correct some of these sleep problems. From hybrid beds to adjustable frames, there’s a mattress solution out there that will meet your sleeping needs. 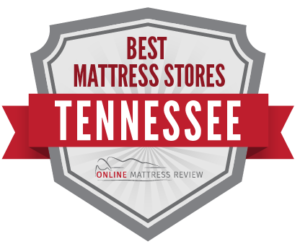 We know that finding a mattress that works for you and your budget can be daunting so we combed through the state of Tennessee and found the highest ranked mattress shops by region. Then, we examined the product and compared those with prices elsewhere. We hope we narrowed down your search! Rest assured that if you’re in the market for a mattress, you’ll find what you need in one of the shops listed below. Wondering: Where can I find a mattress in Nashville? We have got you covered! Sanders Furniture (5000 Charlotte Ave.) is a family-run business that offers great products and high quality customer service. Whether a veteran mattress shopper or first-time buyer, you will not be disappointed with the customer service and quality of product. Mattress Firm Green Hills (3909 Hillsboro Pike) is another option if you are unsure of where to head for a mattress. The sales team works with you to find a mattress that meets your needs. Mattress Firm offers a 120 day refund policy. Be sure to give that a try as mattresses will take a little while to adjust to. The delivery service is also reliable. If you check their website seasonally you may even spot a few discounts. Try purchasing around Martin Luther King Day or other national holidays for a steep discount. If you are East of Nashville and can’t get to the city center, no problem. There is a mattress shop near Nashville directly in Antioch. Mattress Express (2412 Antioch Pike) offers quality mattresses and great prices. The sales staff are incredibly knowledgeable and will help you navigate to big wide world of mattresses. No need to travel into the center of town for a great product, you can find one at Mattress Express. When shopping for a mattress in Memphis, why not try Mattress Firm Ridgeway Trace? The prices are the same at most Mattress Firm locations, but customer service can make or break a purchase. If you have any questions or concerns before your purchase rest assured at this location. There is a knowledgeable sales team that will help you find a mattress that fits your sleep needs and your wallet. If you are looking for a quality and affordable mattress, try Sleepy ZZZ’s Mattresses. Sleepy ZZZ’s Mattresses offers name brand mattresses below competitor’s prices, and is a locally run business. Does it get any better? Mattress Firm East Memphis (4629 Poplar Ave.) has a knowledgeable staff that will help to match you with the perfect mattress. Here’s a tip: a number of mattresses go on clearance and may be purchased at a steep discount. If you are looking for a great buy you might find it here! Do you need to get a mattress in Knoxville? Mattress Firm Turkey Creek (11137 Parks Dr.) may be the way to go. This location has a wonderful sales team that really know their stuff! You won’t get hassled into a purchase and discounts as well as free delivery are often part of the package. If you are a looking for a no-hassle purchase, try here! There are a few locations of The Bed Store in Knoxville. This one is out by Farragut (11249 Parkside Dr.). Here you will meet a knowledgeable sales team that won’t pressure you into a purchase. There are a wide variety of beds available at a many price points. If you aren’t getting a great night sleep and need a sales team to help you solve your problem, try here. O. P Jenkins Furniture is located downtown (209 W Summit Hill Dr.) and is a great place to shop for a mattress if you are also looking for a mattress and a bed set. The job has a large selection, and the sales associates are knowledgeable and will work with you to find a mattress and bedding to meet your needs. If you are looking to find an organic mattress in Chattanooga you could start with The Bed Boss (7315 Lee Hwy Suite 179). The Bed Boss sells high quality organic mattresses that will help you get a deeper night’s sleep. The customer service team understands the products and will help you find a bed to meet your sleep requirements. Chattanooga Mattress (6800 Ringgold Rd.) is known throughout town for their quality customer service. And if you are looking for a trusted mattress source, then Chattanooga Mattress is a great option. Mattress Firm Hamilton Point (7200 Shallowford Rd.) offers a wide-range of mattresses from queen, to king ,to gel, to memory foam. At this location you will always have 120 days to try your mattress, and the staff are knowledgeable and friendly. Mattress Firm does price matching so be sure to look around and see if they can work with you on the price. MurMaid Mattress (2271 Gunbarrel Rd.) offers an array of name brand mattresses and a no-pressure sales team. They also offer free delivery on some days. Additionally, be sure to check their website regularly for listed discounts. Another more discounted option is Mattress Firm Clearance (5505 Tn 153 Hixson,). This is a great option for anyone who needs to shop on a budget. There are a vast array of affordable mattresses at this location as well as a sales team that will help you find a mattress to meet your needs.